About Michele: After over 25 years in the legal field, Michele, a practitioner of yoga for five plus years, decided a more peaceful career path would allow her to grow physically, mindfully, and spiritually. Yoga provides Michele with an overwhelming sense of pride for having done something for herself, and has allowed her to relieve stress. She is at ease with herself in her own body. Michele completed her 200-hour teacher training with Boston Yoga School, under the instruction of Ame Wren, Caroline Pineau, and Jen Duran, which enriched her understanding of hatha yoga, yogic philosophy and lifestyle, anatomy and physiology. Michele has attended many workshops and will always be a student of the practice. 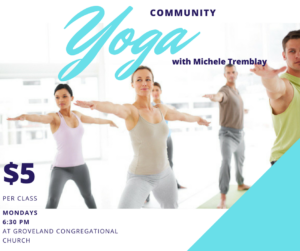 Michele’s teaching goal is to provide a balance between fluid movement, grace, strength, and agility, all the while connecting with the breath. She strives to create an atmosphere that is welcoming, safe, and lighthearted for yogis of all levels to decompress from the outside world. Come check out a class! Register on the website to ensure your spot.